2012 has only just gone around the corner but the spring/summer hair trends for the New Year have already been revealed. With every year comes new cutting-edge styles of fashion to follow and what is fantastic is that the trends below are really easy to imitate. Often or not it can prove more difficult trying keep up-to-date with the latest fads however, that is the great thing about hair; there are so many different styles, colours and shapes that there will always be a trend to suit you. It really doesn’t take a lot of effort to get on board the trend wagon and think of it like this- if there are any blips along the way, you can always just get off at the next stop! This is a brand new trend that is THE hair style for spring/summer. It offers effortless elegance at a time when the weather is hot and humid. 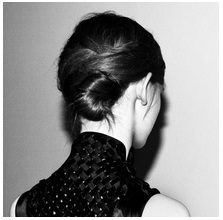 Don’t sweat the climate- this undone updo is fresh and perfect for any occasion. This wet look is perfect for the beach. Simply slick back the top and keep the hair textured or tousled below. Two-in-one textures have dominated the designer catwalks including the likes of Missoni, Derek Lam, Rag & Bone and Giambattista Valli. Fashion has swung back to The Sixties. The era was heavily influenced by the ‘hippy’ culture and the Beatles, but hairstyles predominantly included beehives and the chignon. The designers Marc Jacobs, Moschino and Louis Vuitton have transformed the iconic hairstyle and turned it retro. Some gentle, tumbling waves at the tips of your hair are fantastic for a fresh, summer look. They give your hair some femininity and style; and anyone can achieve the look. Whether you have natural waves or need to use curling products, bouncy curls will definitely give you an edge this season. So there you have it, the top 4 hair trends for spring/summer 2013. Whether you have short or long hair, curly or straight; there is bound to be a style you can recreate with the help of some hair accessories. This article was written by Lauren Grice on behalf of Hershesons, the specialists in high-end hair accessories. Visit www.hershesons.com today for all the latest styles and tips.